Edgar fans, get ready to meet Odile, a second outlet for the creative culinary force led by Marysol Foucault. The new restaurant, which will open in about a month, will also be located in Hull, a five-minute drive away from Edgar. In terms of size, the new spot is equally tiny, but the setup will allow for more restaurant seating (perhaps 20-25 inside) plus its large outdoor patio will seat at least 30 more in good weather. While the food will be consistent in both spots (the kitchen team will rotate locations to prevent playing favourites), Foucault plans to make Odile a dinner destination as well, once the alcohol permit is in place. The instant and intense popularity of Edgar, which opened at the end of 2010, has been both a blessing and a curse. For all of the satisfied customers who rave about the wonderful baked goods, tasty take-out meals, brilliant sandwiches, and stellar brunch dishes, there are those who have been turned-off by the line-ups and long waits that they can often encounter — especially on the weekends. “People aren’t used to waiting on the Quebec side,” says Foucault. “They get impatient.” She began searching intensely for a new spot to complement Edgar last October and waited until she found one that had a closed kitchen, modest size, and a great patio. Both Edgar and Odile locations were formerly meat-free eateries. “We joke that I eat vegetarian restaurants,” says Foucault with a giggle. While veggie options are always on the menu, Foucault’s passion for pork fat keeps her meat-loving devotees happily oinking for more. 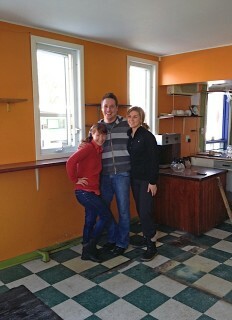 Coming Soon: Odile, 47 Monclair (corner of Berri), Hull.